Just a little note. I have a new computer and when I started using FrontPage on this computer, I had a little trouble with the site. It's nothing really major but the buttons are not working properly. When you hover on the buttons, they don't work right. It will take me awhile to fix them and I probably won't bother until school's out. Everything else seems to be working properly but if you find anything amiss, please let me know. I started a quilt today for Bill's coworker, who is getting married late June. It's made with Log Cabin blocks. So far, so good. I made a couple of sample blocks with some fabric I had on hand, before starting with the fabric for the quilt. I made a quilted pillow out of one of them. I also got one of those pre-quilted panels to make a baby quilt and edged it with the strip I had left from making our bed quilt. It's for Lorelai, of course. 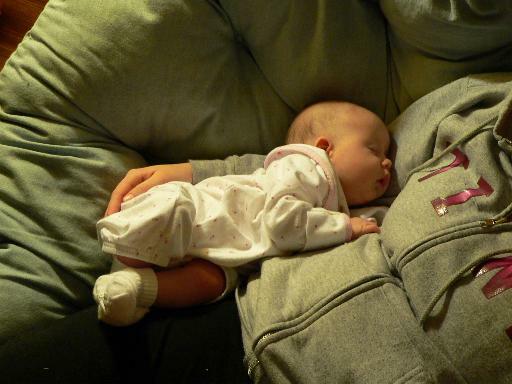 Her new crib should arrive later this week, hopefully, and she can use another quilt. It's the unofficial start of the summer season and the weather appears to be following suit. It's currently 82 degrees and it's been sunny, though quite humid. I think some rain, possibly thundershowers, are expected later today or tonight. 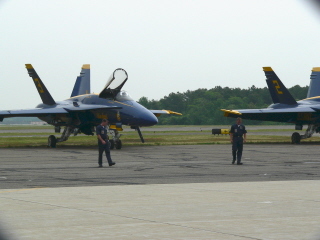 The Blue Angels and the Golden Knights are in town. I discovered that on my way home from work on Thursday afternoon. As I was driving down Straight Path, approaching the Southern State, I saw them fly in formation over Straight Path, then individually fly over in the other direction. Pretty cool sight. 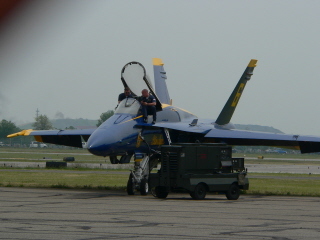 We'll probably head over to Jones Beach tomorrow to see the air show. But yesterday afternoon, we took a ride over to Republic Airport to see them parked there. The pictures were a little difficult to take because of the chain-link fence. I put the lens of the camera into one of the fence openings and, except for a little shadow from the metal, got some pretty decent pictures. We went on a shopping expedition today to buy Lorelai's new crib. She's been sleeping in the bassinet and then a cradle but she's outgrowing the cradle so it's time for her to have the crib. It's pretty. It's white and one of those convertible ones, which are really cool. It goes from a crib to a youth bed to a headboard for a double bed so she'll be able to use it through her teens, if it stays in good enough shape. We also picked out a changing table. They can pick out a dresser later. With the closet and shelves and the changing table, which has two shelves with baskets, that's probably enough room for her things now. Up until now, when they didn't have the room ready yet, her things have been in baskets. So, that's all she needs for now. I love this picture. She's so cute. I tried to relax a little on Tuesday but I had cleaning and chores to do so that ate up some of my relaxation time. Wednesday, of course, was class and the finale of American Idol. I got home in time to see the end of the show. I'm happy that Taylor won. I liked him from his audition. We had done the food shopping in the afternoon before I went to class so, another busy day. 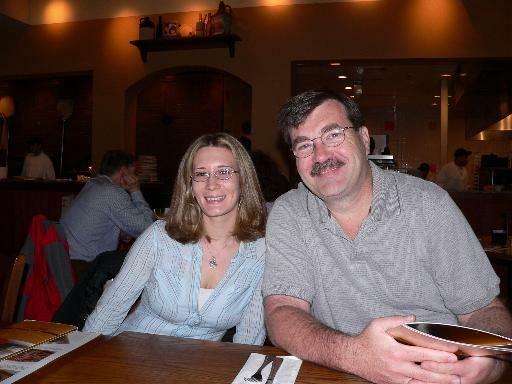 On Thursday evening, Jan, Eric and I went to see the benefit Douglas participated in, after having dinner at Markt, the Belgian restaurant where Lori's boyfriend, Jon, works. I haven't seen Eric and Lori in quite awhile so that was nice, getting together again. And Jon is a lovely guy, very nice. We didn't have a lot of time so we just had soup and bread for dinner and then went to the show, which was due to start at 7pm and really started around 7:25! Douglas was so good, singing two songs from a show written by the featured composer, Glen Roven. Douglas made the villain charming as he sang about how to dress when you plan to take over the world. The young boy who sang two songs from the show, Noah Galvin, I believe his name is, was wonderful. He has a beautiful, expressive voice. Sandy Duncan narrated an orchestral piece based on the children's book, The Runaway Bunny. We had a great time, made better by the fact that I had Friday off because of an unused snow day. I really needed the break. 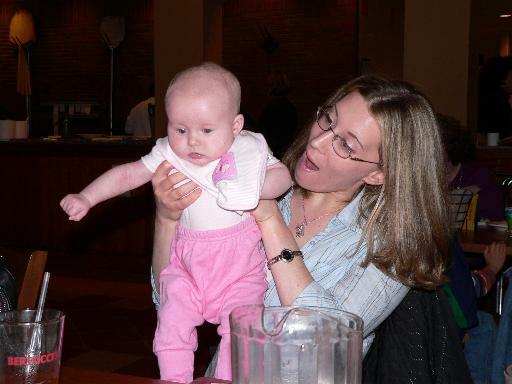 Kelly and Laura went to see Scott in True West in Lindenhurst so Lorelai stayed with Nana for a few hours. Kelly's off tomorrow so I won't be babysitting. Maybe she can come with us to see the air show. Monday, I think I'll be working on the quilt I'm making for Vanessa's wedding. That's a relaxing way to spend the day. I made another sock, different pattern, and now I'll go back and finish the blue/purple blend socks. Less boring that way! ta-ta and enjoy the lovely weekend. The Scarlet Pimpernel Message Board, which has been the home for SP fans for many years, has been moved to a new site designed by Peter Williams, webmaster of the Scarlet Pimpernel official site. The Wildhorn Fans message forum combines the boards for Jekyll and Hyde, The Civil War and The Scarlet Pimpernel in a convenient location. I hope that everyone who had been visiting the SP board will register and frequent the new site. Socks are magical. Socks are also quickly becoming my favorite items to knit. 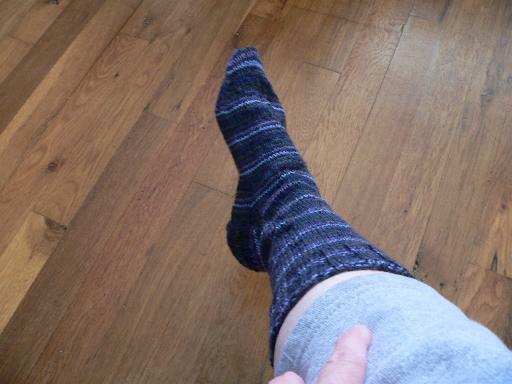 I hate sewing the pieces together when a project is complete so socks, like sweaters knit in the round, are wondrous. When I take them off the needles and draw the yarn through those last few stitches (I also hate grafting), the sock is done. I can put it on my foot and admire my handiwork. Socks also appeal to the history student in me. Every hand-knit sock is constructed in essentially the same way. There may be variations in the heel or toe but at the core, we knit socks the same way people have knit them for centuries. A sock consists of two tubes connected by a heel, "turned" in an amazingly simple technique. I feel a part of history when I knit a sock. I feel I'm carrying on a tradition. It's magical. I have a new pattern I plan to try with four colors. Why would we bother to knit socks with four colors when we'll probably be the only ones to see them? Hey, why not? It's fun. I have a cold. I can't remember the last time I had a cold so I'm not at all happy. I had planned to go to the city today for lunch with Deb and friends and I'm disappointed to be missing it. I hope I feel better before Monday, when Sue and I will interpret the readings. I usually get over colds quickly. I hope that if I relax this weekend, I'll feel better. School countdown: I think it's 17 days. Whoop de doo! Also, two more Wednesdays and class is over. Lately, the only entries I get in the site's guest book are advertisements. So, I changed the properties so I have to approve entries before they'll appear. I do get an email informing me when there's an entry posted but they always wind up in my spam folder so if there's a message, I'll see it every three days when I check that folder. 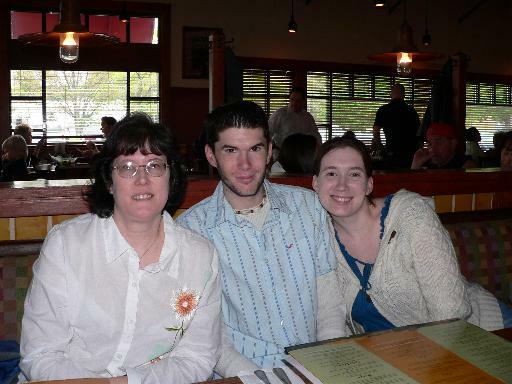 On Mother's Day, we went to Bertuccis for dinner and we had a really nice day for Kelly's first Mother's Day. She was surprised that we all gave her gifts. It looks like the weather's a tiny bit better today. It seems like we've had nonstop rain lately. I guess the ground needed it but, enough already. Yesterday, it was like Florida without the heat. We had heavy rain in the morning, then sunshine, then more rain, then more sunshine, followed by thunderstorms late in the day. Holy cow. Wishing a very special day to Moms everywhere. It was quite blustery today, drizzly, too. I looked at my calendar for the month of May earlier today and discovered that I'm extraordinarily busy this month. Not all of it is drudgery, however. I have some entertaining entries as well as some must-do type things. We are halfway through with the ASL class. That ends May 31. Not bad. Sue and I will be interpreting DUETS, readings of two-character short plays on May 22nd. Bill and I have tickets to see Nathan Lane and Matthew Broderick in The Odd Couple next week. The following week, Jan and I will get together to see Douglas in a benefit concert at a place where Eric works, believe it or not. We haven't seen each other or Douglas in quite a while so I'm looking forward to that. My friend, Deb, will be moving to Hong Kong shortly to work at the embassy there for 2-3 years so we're getting together with friends in the city one weekend this month to bid her farewell. Also, there are (drum roll please) twenty-three days left until I'm off for the summer. Not that I'm counting or anything. Sigh. I'm so ready for vacation. I will interpret graduation on June 23 and that will be it. That weekend is also busy with a wedding and sweet 16 party. Wow, when it rains, it pours. 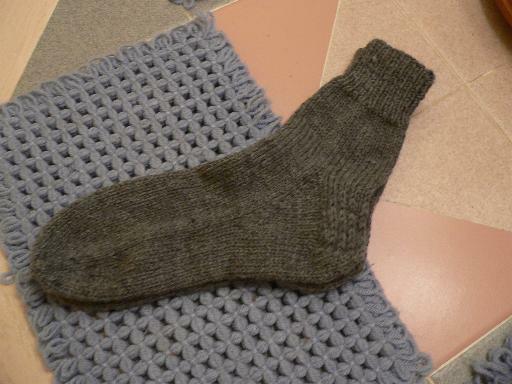 I did finish Bill's socks sometime last week, Tuesday, I believe. I took pictures but I don't think I uploaded them yet. I'm working on two different pairs of socks for myself now. One is a work in progress I started some time ago. 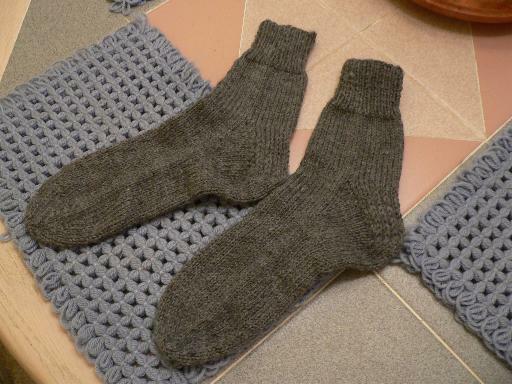 They are called Welsh Country stockings and are from a book called Folk Socks. 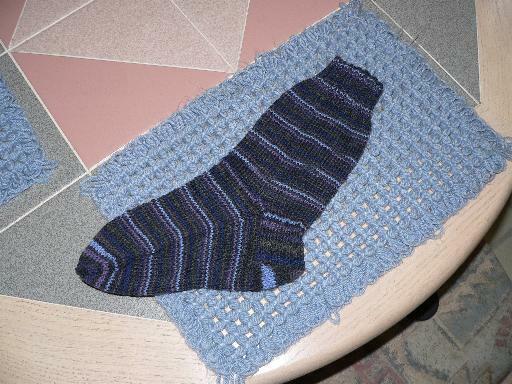 The other is just a basic sock pattern from a book I just finished reading called Knitting Rules! by Stephanie Pearl-McPhee, aka the Yarn Harlot, who has a very funny and insightful blog I enjoy reading daily. I'm using a self-striping yarn in shades of blue and purple, really pretty. I will post pictures of the socks when I get them here on the trusty laptop. May Showers bring what? June flowers? It's May and it seems like I just changed the month here. Ok, ok, I know I waited way too long last month to move into April. Work with me here. It's a drizzly day but I shouldn't complain. It's been sunny and beautiful for a long time. That's about as accurate as I can be, a long time. I don't know. It's been nice. So, a little drizzle isn't so bad. But here I am and it's only the second of May. Aren't you proud of me for my promptness this month? I know I'm impressed. 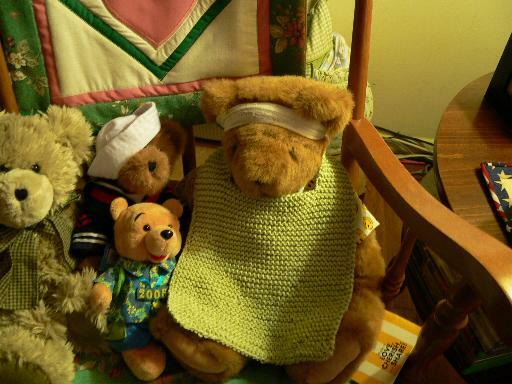 ...shown here modeled by Kim's Vermont Teddy Bear. It's a little big on Lorelai but it's absorbent, much better than the terrycloth bibs. I will make more when I can. Right now, I'm finishing off the second of Bill's socks. I'm past the heel so it won't be long now. I also have a cotton burp cloth started as an in-between project. It's cute, two colors. Speaking of Lorelai, she's a genius. Three months old and she can imitate when we blow raspberries. She's also a very happy, smiling and, recently, laughing baby. Cute as a button. Surprisingly, I actually have enough students for my ASL class this semester, six students. Originally, when I was given the class list, there were nine people listed. I can't believe people would register, pay the money and then never show up at all. Amazing. Anyway, it's a nice group and classes will end the end of this month. It's hard to believe but school will be over in about a month and a half. This year flew, as usual.